The Dri Eaz DrizAir 2400 Dehumidifier is a high capacity unit designed for water damage restoration on commercial and residential sites. It is a very powerful Low Grain Refrigerant dehumidifier capable of effective operation across a wide range of temperatures and purpose-designed for frequent relocation from one location to another. 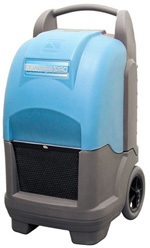 This is a robust and reliable dehumidifier ideal for larger scale restoration work. The DrizAir 2400 is a powerful dehumidifier with a water extraction rate of 148 pints per day at the Association of Home Appliance Manufacturers (AHAM) specified test conditions of 80°F and 60% relative humidity. In more extreme conditions this rate will be greater and at 90°F and 90%RH this unit can remove a massive 240 pints per day from the air. With such a large capacity this unit is very suitable for larger scale water damage restoration projects whether on commercial sites or private homes. The DrizAir 2400 is also capable of effective operation at almost any ambient temperature it is likely to encounter. In extreme heat the unit will function flawlessly at up to 100°F. It is also capable of low temperature operation down to 33°F. Low temperature function is made possible by the inclusion of a hot gas bypass defrost system which actively melts the ice forming on the condensation coils and minimises down-time. The 2400 benefits from the use of Low Grain Refrigerant (LGR) technology which makes this unit far more suitable for water damage restoration applications. This technique pre-cools the air drawn from the drying area before passing it over the condensation coils. Pre-cooling the air results in a greater proportion of water vapour in the air condensing onto the coils. This technology has two major advantages. It enables a dehumidifier to remove more water from the air when it has a low level of specific humidity. Specific humidity is a measure of the absolute amount of moisture in a given volume of weight of air, usually expressed in terms of "grains of water per pound of air". Unlike relative humidity it is not temperature dependent. When specific humidity reaches a level of around 55 to 60 grains per pound a conventional refrigerant dehumidifier is incapable of lowering the moisture level further. A low grain refrigerant dehumidifier will continue to remove moisture until the specific humidity is below 40 grains per pound and may bring it down as low as 32 grains. This advantage makes an LGR dehumidifier, like the 2400, a more effective unit, particularly in situations deep drying is required. The second advantage of LGR dehumidifiers is that this method of removing moisture extracts more moisture without consuming more energy and the 2400 is more energy efficient as a result. The Drizair 2400 is configured for continuous drainage and incorporates an internal pump and 40 feet of drain hose for the purpose. This pump is sufficient to carry the water a greater distance from the dehumidifier than a simple gravity feed but does not have the power to lift the water to a drain or other outlet at a higher level. The unit incorporates an automatic pump purge system to empty the water from the reservoir every six minutes and a one touch purge facility to empty the machine of water before it is moved. The 2400 also incorporates electronic controls and a fault diagnosing function, reported by designated codes on the digital display, unique to Dri Eaz dehumidifiers. It has a built in ring for the attachment of ducting and an effective high airflow filter. The DrizAir 2400 is a durable unit enclosed in a tough roto-moulded polyethylene housing. It is easy to manoeuvre on site with an integral handle and two rear-mounted wheels and is robust enough for transport between sites by a small truck or other vehicle.